So my boyfriend is a baker. Well that’s not entirely true. He’s a news director who is very good at making cookies and cupcakes, cakes etc.. (Saying he’s a baker sounds like that’s ALL he does which isn’t true…I digress) He made yummy chocolate cupcakes that he brought to work and people gobbled up and the best part is they are gluten free! See people, gluten free can be delicious! 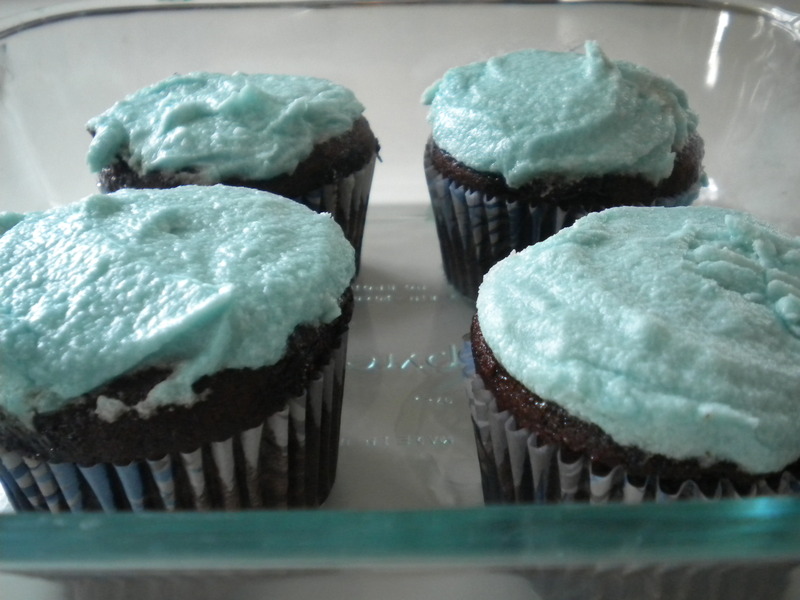 He also made a vegan frosting for the cupcakes which was pretty good too. Our co-workers were surprised that a gluten free cupcake can taste so good! I’m sharing his recipe with you so you to can amaze your non gluten free family and friends. Preheat the oven to 350ºF. FOR CAKE: Lightly grease a 9 x 5 pan (pam it good and well particularly if you want to get it out of the pan when it’s cooled). FOR CUPCAKES: Place cupcake liners into a cupcake pan. Sift together gluten free flour, sugar, cocoa, baking soda, salt and xanthan gum. Mix well. The batter should be an even light brown color all throughout. Then add in oil, water, and vanilla. Again, mix it all together until all the ingredients are incorporated the best you can. The add in the vinegar LAST. Add the vinegar LAST and after all else is well mixed to avoid it reacting to much with the baking soda (“Volcano” reaction= bad and you cake may not fluff). Mix until as smooth and pudding-like the mixture is. If you have a hand beater or a blender use that, a wisk might work well too in the absence of either of the other two. Pour into prepared pan, and bake for 45 minutes (FOR CUPCAKES: Pour approximately 1/3 c batter into each cupcake tin, bake for 20-30min). Check it after that with a knife in the center. If it comes out with batter still on it then bake it for longer (at least another 10 minutes for cake 5-10 minutes for cupcakes, but you judge based on how much liquid is left). Get margarine (or vegan butter) softened enough to be easily mushed. Cut it into a small mixing bowl in about tablespoon sizes. This will make it easier to mix in. Add in powdered sugar (not packed but just above the top of the cup), and cream together with margarine. It will take a while. If it still looks powdery at all, keep going because you’re not done yet. I recommend using a wooden spoon possibly one with a flat end that is cut in a slant so it will run more easily over the bottom of the bowl. Add in vanilla. And mix in. Then add the coconut or almond milk. Mix it in, whip is probably better way to describe it. Then slowly add in 1 tsp at a time, whipping between each, until it is smooth enough to be spreadable. Leave out on counter, and mix occasionally until cake comes out and is cooled COMPLETELY! Frost cooled cakes or cupcakes.